Serves 4-5 with rice, a salad and softened nann bread. Preheat oven to 475 degrees. Line a cookie sheet with foil and oil or spray with a Pam product. In a large bowl, combine turmeric, garam masala, the ginger, salt, and 1 tbsp. 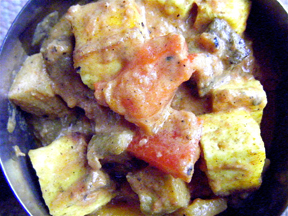 oil add eggplant and panir cubes and toss to cover. Place eggplant and panir cubes on the sheet and bake for about 20 minutes until eggplant is soft. Meanwhile, add 1 tbsp ghee into a stock pot, add pepper and saute. Add cumin and coriander powder, and tomato. Simmer for 5-10 minutes to cook peppers and let spices mingle. Finally, add cooked eggplant and panir. Fold in the coconut milk.